Bernie Ecclestone: "They'll get on with it. Or not. Nothing we can do about it." Doubt remains over the future of the Italian Grand Prix at Monza, according to Formula 1 boss Bernie Ecclestone. Monza has hosted an F1 grand prix every year since the championship started in 1950, bar one, but the contract to stage the race runs out this year and a new deal is yet to be agreed. Ecclestone wants a higher fee to stage the race from the circuit owners. "I don't know what's going to happen. It's a little bit Italian at the moment," said the F1 supremo. "They said to me a few months ago 'everything is sorted out, and it's all agreed and no dramas'. "Now I heard yesterday it's become very political. They'll get on with it. Or not. Nothing we can do about it." Angelo Sticchi Damiani, president of the Automobile Club of Italy, said last month that the basis of the contract had been decided with only minor details to be resolved. "There's no deadline. 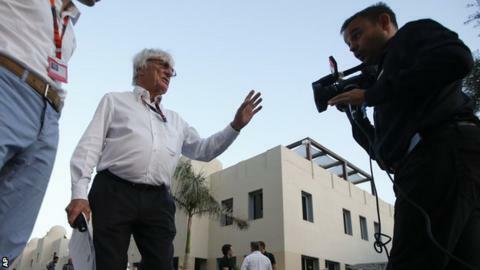 They can take as long as they like, provided it's by the end of February," added Ecclestone. If Monza was dropped from the F1 calendar, Imola - home to the San Marino Grand Prix from 1981 to 2006 - or Mugello could stage the Italian race. Will F1 lose the cathedral of speed? Read more on Monza: Will Formula 1 ditch the cathedral of speed?